"Gentlemen, your mission - should you choose to accept it - is to prove to the world that you are even more incompetent than the English RFU. This message will self-destruct after approximately 6 months..."
This may as well have been the message delivered to the New Zealand Rugby Union after the Rugby World Cup because, in a week when the RFU has been universally ridiculed for its handling of the Ashton-Johnson affair, the NZRU has finally managed to deliver its Review of the All Blacks performance at the Rugby World Cup - yes, remember, the tournament that finished back in October. Not only did it take the NZRU (or whichever bright spark they hired) 6 months to deliver the report, and not only did they go ahead and re-appoint Graham Henry months ago before they even had the first inkling of the report's contents, but the report itself somehow manages to break new ground in terms of pure gobbledegook. Apparently, for instance, Graham Henry didn't rotate the All Blacks selection prior to the World Cup quarter final - he obviously just changed his mind quite a lot about who his first choice players were and is probably why NZ ended up with a fullback playing centre for the third successive World Cup - anyone see a pattern emerging there? Equally, while Henry's controversial conditioning programme is quite rightly criticised (although Henry himself appears to escape censure for some reason), there seems to be no mention of the selection of a half-fit Dan Carter, a fullback at centre (did I mention that?) and a palpably unfit Keith Robinson (to give him game time and build up his match fitness for the next round) for the quarter final - although apparently the All Blacks didn't underestimate the French - much. The report also seems to justify the on-field decision not to go for a drop goal in the last 10 minutes of the quarter-final by commenting that the players decided to continue with the tactic of attempting t o score a try or to get a penalty because they were unaware that the All Blacks had not been given a penalty in the entire second half. In other words, it's still that dastardly English referee's fault and nothing to do with crap leadership on the field. I've no idea what the NZRU paid for such a report and I'm sure they all feel it's money well spent - but what shocked me most was the failure to mention the primary reason for New Zealand's exit - i.e. 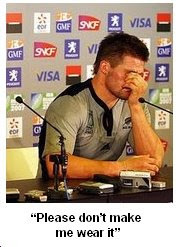 the clandestine IRB conspiracy that permitted the French to change their kit from their traditional blue to a despicable dark navy, a decision which forced the New Zealand team to wear those horrible grey shirts for the quarter final. P.S. Don't just take my word for it - check out Sportsfreak's 720 degree holistic review of the review. How Graham Henry has kept his job in a rugby-mad place like New Zealand after not even placing in the top 4 with a dominant team is still a mystery to me. If they'd have sacked Henry, then Wales wouldn't have got Gatland. So it was a good call with me! on the 360 degree holistic review of the strategy. Going forward.